Testing your feed lets you know what you are really feeding. An updated list of labs offering mycotoxin testing is now available on the OMAF website. •	As shown in the above chart there is quite a difference between both the old and new corn crop prices this year (2013) compared to a year ago (2012). 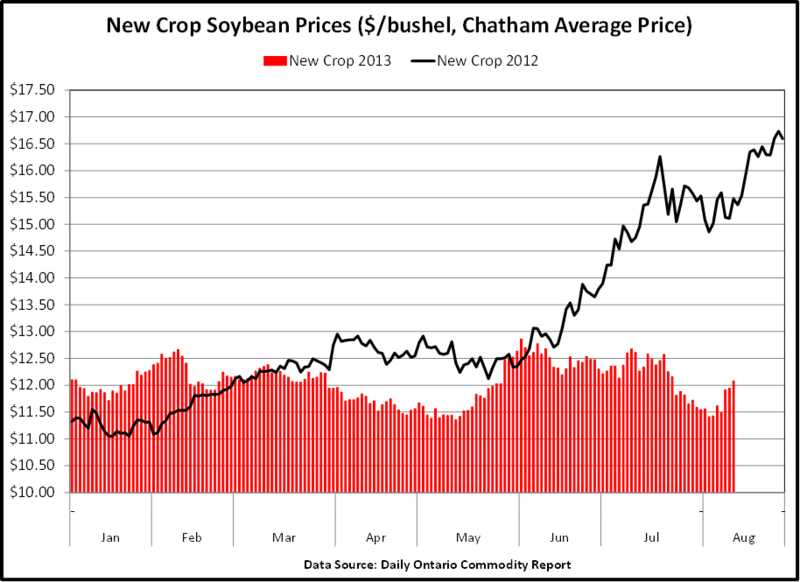 •	As the market place reacted to the dry weather impacts last year in June, corn prices increased significantly. •	This year with moisture in the spring and 63% of the corn crop in good/excellent condition (about average but significantly better than the 24% rating last year), the current anticipation is for an increased corn harvest this fall to replenish corn stocks. •	Old crop corn prices remain above the new crop corn prices ($5.81 versus $4.08) but this gap will eventually close between now and harvest. •	The graph below comparing the trend of daily new crop corn prices this year to last year shows the impact of weather on the markets and the challenges of making marketing decisions.